Our latest digital marketing and SEO campaign for Security Baron featured in USA Today (print). 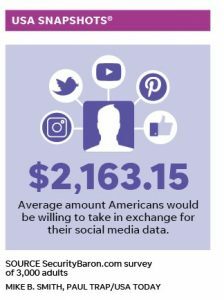 The campaign explored just how much Americans value their social media data – that is, how much they would sell it for, if someone offered to buy it. Below is the interactive infographic which we put together to accompany the release.